Afton Village, A Road Map Through The Recession? Lakeside Primary Care – Management office of one of the region’s largest health care systems. 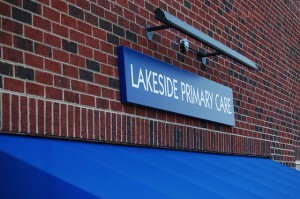 Lakeside Primary Care, a division of Lakeside Family Physicians is a key component of the medical community in Afton Village in Concord. The health care group is affiliated with Presbyterian Healthcare. Lakeside Primary Care’s 5,000 square foot office space in Afton Village’s Cambridge Building was also designed with the highest regard to wellness and patient care. Says Griffin, “Waiting rooms are separated into sick and well rooms, with nine exam rooms designed around a centralized nursing station for quick access to nurses. We have two procedure rooms and also offer onsite X-rays, rapid test lab work, and stress testing.” The practice also is a short drive from its sister location on Speedway (Bruton C. Smith) Boulevard location which has Ultrasound, echo, a complete lab and extended hours, increasing the delivery of results and treatment. its location and well-planned ‘new urban’ layout. “Afton Village was centrally located to the quickly growing population of Concord. There is a broad demographic in this community that is a perfect fit for our age-specific healthcare services,” says Griffin. Services include preventive healthcare and treatment for all populations including newborn, infant and pediatric care, adolescent, adult and geriatric care, and routine gynecological care. The practice also provides care for acute and ongoing illnesses, school, sports and employment physicals and immunizations, minor surgery and orthopedic procedures, laboratory and X-ray services and same-day sick appointments. Lakeside Primary Care is currently accepting new patients and is located at 5325 Vining Street, Suite 101 in the Cambridge Building in Afton Village. Patients are encouraged to schedule a well appointment to get familiar with one of its three board-certified physicians. Most major insurance policies are accepted. Call 704-384-1041 with questions specific to Lakeside Primary Care. Visit our Flickr website to view pictures of Party on the Plaza events. Feel free to download, print and share these photos with your friends and family. Patterned after our most beautiful traditional historic neighborhoods, Afton Village is planned with the pedestrian in mind. Tree-lined streets and a network of wide sidewalks will create a strong pedestrian connection between residential areas and the commercial Main Street, the Village Green, and the 60 acre park that bisects the community.